Experience and explore night time Biscayne Bay fishing while overlooking the Miami downtown skylights! Just minutes from downtown Miami, FL. view its beautiful blue water in the darkness. While experiencing the thrill of a chance to catch sea trout, snapper, snook, mackerel, grouper, jack crevalle, ladyfish and bluefish all while viewing Miami Heat arena. Many fishing enthusiast want a good meal to take home and this is a great location for Sea Trout one of the best fish in the sea. All tours are guided by a licensed Captain in a modern boat, he provides the fishing rods and reels, right and left handed and all the tackle you can use and all other necessities including safety equipment. Generally the start time is just before dusk to make sure you find the location and to make it easier to navigator the boat. Once you arrive at the meeting destination, your Captain will provide instructions and safety check. Once everyone is on board, off we go all while watching the breathtaking sunset over Miami. Once you arrive at the first location, your captain will help with instructions and casting lessons which are all included for beginners and advanced techniques for the experts. Tours are suited for both first-timers, experienced anglers, elderly, youth, families and children of all ages and are handicap friendly. Rest- a-sure everyone will have a blast as you fish with ease and comfort of the calm backwater never needlessly worrying about being seasick. 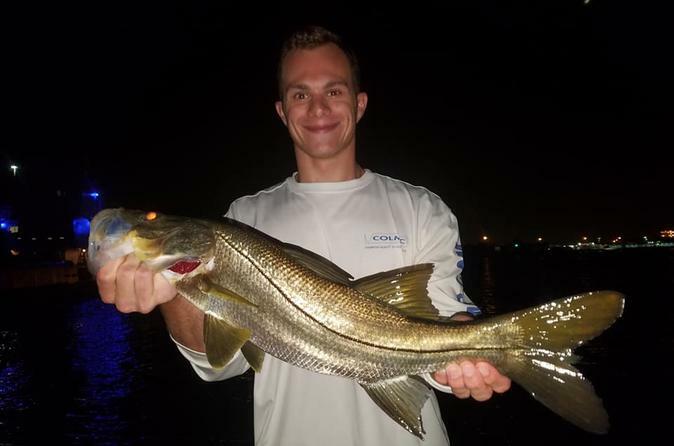 Enjoy the feeling under the lights you can expect to catch Trout, Snook, Tarpon, Jack Carvel, Shark and many other species that spend their time feeding at night. This is an adventure you surely would not want to miss out on in this lifetime! While out on the water, the boat has coolers on board with ice and bottled water to keep you hydrated. There's plenty of space to bring dinner sandwiches or your additional favorite beverage. Alcohol beverages in cans are preferred, but not required. Once your boat docks, this will conclude your trip. Please note: All charters are subject to weather. In the case of unfavorable weather you will be provided the option to reschedule or refund.